Garion is just a regular farmboy, raised since infancy by his aunt Pol, the only family he has ever known. But soon enough Garion’s life takes a drastic turn. Suddenly, he is swept up in a quest for some mysterious, and dangerous, object that seems to have been stolen by an unnamed thief, and is taken away from the only life he has ever known. Garion finds himself among diverse new companions and soon enough cannot help but question his relationship with his Aunt and the familiar old vagabond he knows as Mister Wolf. 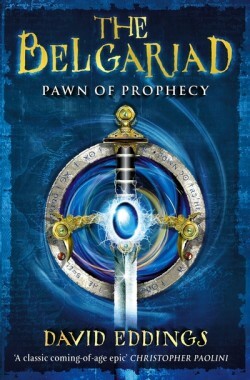 Could they truly be the legendary Polgara and Belgarath? And, if so, who is he? Pawn of Prophecy starts off the Belgariad, a masterful high fantasy series that has found it’s way into the hearts of millions of readers over a span of forty years. It’s interesting (and, for the most part, amusing) characters, as well as Eddings’ writing style in particular, made his books bestsellers when released and kept them popular in the fantasy genre, even today. The main themes of this book – and of the rest of the Belgariad, for that matter – is manhood/coming of age. With each novel, Garion grows (physically and mentally) and learns more about himself. In Pawn of Prophecy in particular, Garion starts to question the life he has always known as well as who he really is. Though coming of age is an extremely common theme in fantasy novels, Eddings pulls it off well and in a fairly original manner at that. Honestly, the characters of Pawn of Prophecy are probably the best thing about the book. Having Belgarath and Polgara, a seedy old vagabond and his daughter, as the main magical awareness in the books is not only original but extremely amusing. And then when you add in the rest of the cast of the book, soon enough the characters end up being your favorite thing about the book in the first place! They keep you involved and reading (an laughing at that) and I love each and every one of them. Much of Pawn of Prophecy is spent in Cherek, one of many countries in Eddings’ world, and I loved reading about the Cherek people and their society – for the most part, the are drunk, bloodthirsty (for certain kinds of blood, anyway) sea-farers who worship the Bear God, Belar. One of the best things about this book is that it manages to really hook you into the series – I managed to finish it in about a day, and started the next book, Queen of Sorcery, almost immediately after reading through that last page! The one qualm of the book – if its even that – I have noticed is probably the prologue. It seems to turn quite a few readers away, and nearly did the same to me. But then, after reading the books, the prologues – kind of excerpts from religious texts and prophecies in the novels – while formally worded and sometimes confusing when you do not know the characters, one of my favorite things about the series. Pawn of Prophecy is the first of many awesome books, in is what is probably one of (if not) my favorite fantasy series in existence! I adore Eddings’ style and flair to death, and the worn out, barely-there condition of my Belgariad set should tell you just how often I find myself flipping through there pages again. R.I.P David and Leah Eddings! Your writing is sorely missed. This review was written by Erin.